segmentation enables the organisation to emphasis Resources in the well organized manner. It is certainly significant for the reason that a company finds it hard to thoroughly fulfill the needs of all the potential customers in a market. Business people and marketing experts are required in the market to be knowledgeable about the requirements and specifications of their potential customers to be able to enable them in order to offer products and services that will gratify customer demands and necessities. This can be challenging, for the reason that there tend to be a wide range of demands and needs in the consumer market that the marketer should be able to fulfil. For that reason, marketing experts should break down the consumer market into several categories considering similar demands and needs. This is actually the course of action involved in market segmentation. Market segmentation is accordingly explained as “the process of dividing a total market into segments or a target market of consumers with common demands or behavior and making a choice on a variety of segments to focus on with a clear and distinct Marketing Mix. Segmentation enables the organisation to emphasis Resources in the well-organized manner. It is certainly significant for the reason that a company finds it hard to thoroughly fulfil the needs of all the potential customers in a market. As an example, the market for hotel and resort companies in many cases can often be divided into several sub-segments; business customers or tourists, sports people, international delegates, holiday break travellers, regional travellers, foreign tourists, and so forth. Each and every one of these segments demonstrates distinctive qualities and requirements pertaining to accommodation, amenities along with services demanded. It makes sense which experts claim that no one hotel or resort can potentially accommodate all the unique requirements associated with all these market segments. Concerning this specific scenario, the business organisations are required to make a decision about which market segment’s demands have more scope for the product or service and how those demands are satisfied. To provide an example, a hotel or resort can make a decision to accommodate mainly for the needs of the business customers or tourists, and then build its market offering around the demands of business class customers. Targeting involves selecting the most attractive segments to compete in. The method found on determining which segment’s to engage in is referred to as target marketing. Therefore, targeting offers with the course of action whereby a marketing mix is structured to suit specific targeted customers”. Right after deciding on the market segment, the company ought to research the practical ideas on how to be competitive in this particular target market. A company can make the decision to be competitive on the basis of price cut, quality, differentiation and so on. Positioning involves establishing a position in the perceptions of the consumers. From another viewpoint a company may come to a decision to be competitive based on its advantageous position and accessibility. Positioning involves establishing a position in the perceptions of the consumers. Product positioning in other terms refers to the creation of a unique impression or good sense of the product by consumers in a chosen target market. It is therefore the manner in which consumers observe competitive brands or kinds of products available in the market. When considering brand new products, it should tell you how the company wants to compare and contrast the new product when it comes to forerunners. Even so, pertaining to both new as well as established products, a product’s positioning ought to end up being mixed with its market segment to be able to properly integrate the marketing Strategy decisions. The marketing experts have a tendency to make an effort to create a constructive position for its product or service by using marketing / promoting communication, in particular advertising campaign. 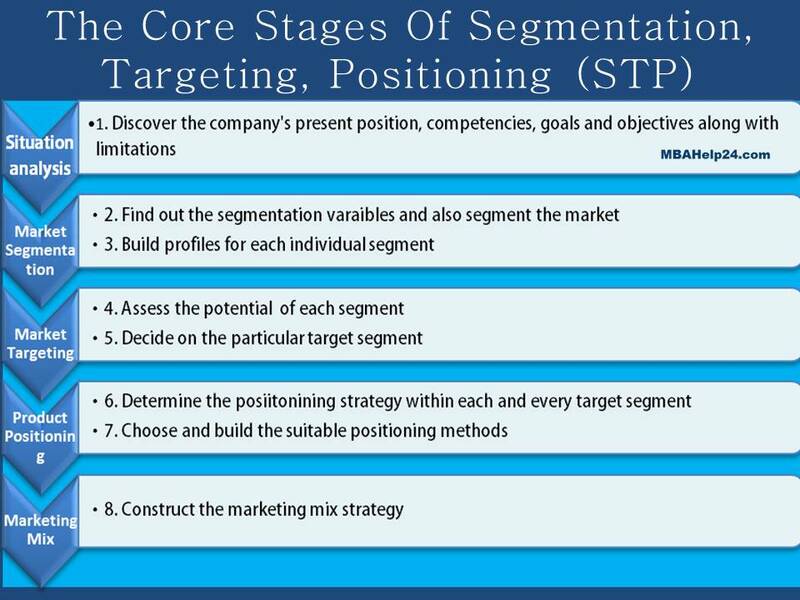 In overall, the real basis of strategic marketing can be summarized in the initials STP (Segmentation, Targeting and Positioning) and the process is actually explained in eight major stages as depicted in the following diagram. Following the firm’s present position is examined, it is achievable for the marketing experts to recognize the distinct segmentation specifics related to their product and consequently build a profile for each and every segment discovered. At this point, the whole set of profiled segments ought to be examined concerning which segments have the capacity to provide the company with a great deal of revenue, in addition to which segment will the company be capable to target most effectively and efficiently. The best appealing segment is chosen and the positioning concept within every single target segment is acknowledged. Following the suitable positioning concept has been chosen, the marketing mix approach can be formulated.